**PLEASE NOTE: Clearance items are final sale - no returns! The Smart Bottoms side-snapping swim diaper features three rows of snaps on each side, allowing you to adjust for the perfect fit. This swim diaper is lined with a moisture-wicking fabric to help prevent rashes and keep solids contained. This diaper meets the requirements for most public pools. 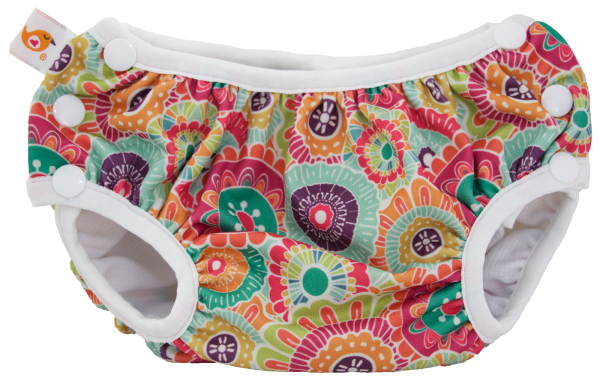 Swim diapers do not require any additional diaper. They are intended to retain solids, not liquids. A reusable absorbent insert may be placed inside when baby is not in the water. We do not recommend any absorbent material be used with this product in the water as it may weigh the child down. 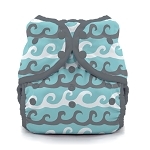 This cover may be used over a disposable swim diaper to meet the requirements of public pools. Gentle elastic around waist and legs won’t leave red marks.